I’m stuck in a snack rut. 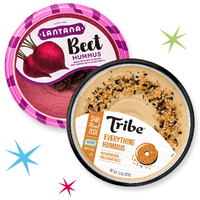 What are you snacking on these days? Shocker alert: Many store-bought veggie chips are just as high in fat and calories as standard potato chips. But it's super easy to bake your own for 100 calories or less! 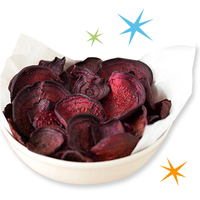 My Best-Ever Beet Chips are as delicious as they are beautiful, and they taste even better when mixed with parsnip chips. And if you're not into raw or steamed kale, bake it into a light and crispy treat! The beet and parsnip chips require a mandoline slicer, but you can get an inexpensive (yet highly rated) one over on Amazon. Crunchy snacks are practically their own food group... But there's more to the crispy treat category than high-calorie chips and tasteless celery sticks. Check out Enlightened Roasted Broad Bean Crisps. 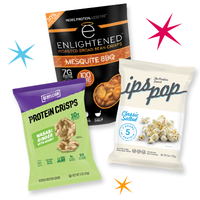 They come in 100-calorie pouches, and the flavors are insane: Mesquite BBQ, Garlic & Onion, Cocoa Dusted, and more. I also love Our Little Rebellion Protein Crisps (10g protein per 90-calorie serving) and Ips Pop (popcorn powered by whey protein). When in doubt, bake or microwave some turkey pepperoni for a DIY fix -- it cooks up into crispy chips! Why should sandwiches be limited to mealtime? These sans-bread sammies are snack heaven! Cucumbers are a fun swap for bread slices. 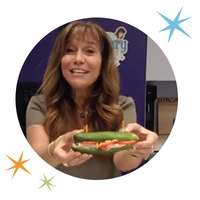 Just cut a small cuke in half lengthwise, scoop out the seeds, and add your favorite sandwich fillings and condiments. I love lean turkey slices, reduced-fat cheddar, tomato, and mustard. But play around with your favorites! How about a BLT cucumber sub? Mmmm... Click to see how they're made! Today, November 1st, is National Cook for Your Pets Day. We've got just the recipe! 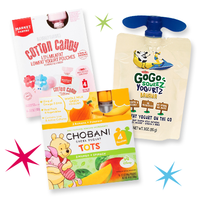 Snacks should be shared... Click "Send to a Friend" to pass these along!